Blackberry House blog retail shop projects and painted furniture: Guest Posting at Funky Junk Today - Let's Make a Pillow! Guest Posting at Funky Junk Today - Let's Make a Pillow! H there everybody. I'm venturing away from my blog today to do a guest post over at Funky Junk Interiors. I've only been around the blogging world for about 6 months now, so I'm still learning. Upon discovering blogs, Donna was one of the first I came across. I googled something about junk, and her blog popped up. I made the connection with her after stalking her silently for a while, and she's been a tremendous help to me ever since. There doesn't seem to be anything she can't answer. I love her style! She's eclectic for sure, but she has a serious rustic industrial thing going on over there that I find myself in awe of. Reading her blog, you'll see her obsession with 'all that's metal', and you'll learn how to look at a pile of rust scraps like it's a pot of gold. She's a true DIY gal by anyone's definition. You'll find a wealth of helpful information on her blog. She teaches you how to turn serious trash into creative treasures. She's the host of the incredibly popular link party Saturday Night Special. I think people challenge themselves to come up with the best thing they can each week just so they can join. I've never seen such great projects in all of blogland as I have in that party. You really must check it out. She has started her own WorkShop Series where she'll teach you anything you want to know -except for plumbing! But she'll give it her best try. Be sure and leave a little note and let her know I sent you. She's announcing a great special I'm running on my aprons from Wednesday thru Saturday. Your post is fantastic, Polly! I'm still terrified of zippers, even though they ARE metal, but yikes!! Thanks for hosting and sponsoring the workshop series and for the upcoming giveaway you're offering! And wow to the special offer on the aprons. As one that owns one, they are worth twice as much as you are asking for them. If you like quality, this is your item. Wow! How exciting! A guest post is so cool! Love those pillows. I will head on over there today! Congrats on guest hosting! I'm going to head over to FJI and check out your post there. The pillows are beautiful!! Your aprons are fantastic with the embellishments and pockets. You do a great job and I know what you mean when you say "a Passion for making something". I get that way myself. Thank you for the chance. I enjoyed your post at Donna's! I just came here from funky junk!!! 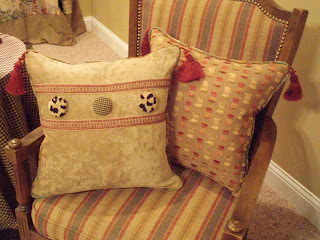 This Ozarks farm chick is lovin' those throw and toss pillows! I'm poppin' over to see how to make them right now. Thanks girl!!! Congrats on the guest post - didn't even get a chance to read that - I was too busy drooling over your work space! Girl, you got it going on! My mom can sew - I'm going to have to show her your space! My outdoor work building should be built in the next couple of months and I am so excited!! Love it and I saw some things I may have to incorporate into my areas!